Where I Got It: I asked Nick to keep an eye out for interesting contemp novels on NetGalley, especially involving diverse authors or characters. He gave me the summary for this one, and it sounded fun. Even though the cover was pink and had lips on it, it didn’t seem like a standard romance, so I figured why not? Cover Notes: I really liked the cover here, although it was a bit pink. I think it implies a more classic romance plot than is really present, but that might just be me. I wish there had been more of an actual image here. There were a lot of things to like about this book. The main character, Leila was a very good YA MC. She was a bit clueless, and a little privileged; which is fairly standard for YA protags. She also had a bit of a social misfit vibe, which Farizan handled very smoothly. It never felt forced or overdone. Despite Leila going to a fairly elite school, Farizan managed to make the story and Leila’s school life feel accessible to me, a middle class public school kid. That’s something I really like in an author. Leila’s family, was also well-written, from my perspective. I felt like there was a strong theme of unreliable narration there, in the sense that at first, you really only see them through Leila’s eyes, but as she grows throughout the book, you realize she’s just as clueless about everybody else’s true selves as any teenager. It’s a common theme in YA, but only because it’s pretty common in real life. The romance plot in the book was also great. Better than many YA romance plots I’ve come across. Saskia is exactly like many of the girls/boys who seem most alluring as a teenager. Now, there are a few cliches common to GLBT romances (and straight ones, too, to be fair): the clueless straight best friend with a crush, etc. But they’re handled pretty well by Farizan. There are some fun twists and turns, and they all felt pretty natural. I said earlier I didn’t see this book as a classic romance; I think I should elaborate a bit. What I mean is that there’s so much more going on here than a straight romance plot. Many (but not all!) romance stories have way more focus on the romance than I’m interested in. Especially with love triangles–(I’m looking at you, Twilight!). There’s absolutely a strong romance component in this book, and it’s marketed that way. But there’s more than just that romance plot, and I think that gives a book more depth. I think a fair number of readers who aren’t romance fans could still enjoy this book. Finally, this is a coming-out story. Not only is Leila not out, but she’s also a bit naive about the whole thing, and she believes many stereotypes about lesbians. The coming-out plot itself is fairly standard. There’s nothing shocking or unique about Leila’s experience, although her cultural heritage–she’s Iranian–does add some flavor to it. Farizan telegraphs many of the developments coming-out-wise fairly early, although she manages to keep the romance aspect of it a bit less obvious to the reader. That said, I’m not really criticizing her handling of it. 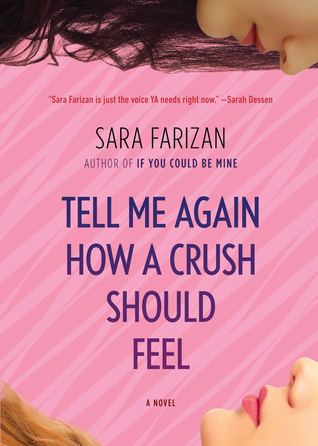 Any readers not familiar with the coming-out narrative in modern fiction will find Farizan’s version accurate and interesting, and there are no real stereotypes perpetrated by the author herself. Buy Or Borrow: If you’re looking for a contemp with strong romantic or GLBT themes, this is definitely worth a buy. If not, you might be better off borrowing it.